Two Nigerian men who duped the secretary of a serving Bombay High Court judge of Rs 2.2 lakh by befriending her on Facebook and eventually threatening her with ‘a judicial enquiry’, after she refused to make more payment were arrested by the cyber police station from New Delhi, India on Friday, April 22. 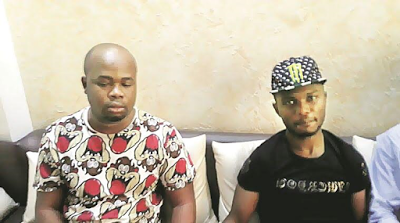 The Nigerian men identified as Casmir Chijioke and Oliver Onyeka befriended the woman with one of them pretending to be a UK national. According to the BKC cyber police, the complainant, who approached them on April 6, told them that a few months ago, she received a friend request on Facebook from a British national. She accepted the request and the two started chatting online, said an officer. A few days after this conversation, the woman received a call from the ‘Delhi customs’, stating there was a gift being parceled to her place and she would need to pay some ‘handling fee’. An officer disclosed that she paid the amount but over the next few weeks, she kept receiving demands for more money under various pretexts to ‘facilitate the transportation of the gift’. She then became suspicious and refused to pay the ‘customs official’ anymore. "At this point, the callers, who knew she worked as a secretary to a judge, threatened her that if she did not make the payment, they would approach the judiciary and a ‘judicial enquiry’ would be initiated against her," the officer said. She quickly made another payment out of fear before approaching the cyber police station on April 6,’ A team led by inspector Ravi Sardesai began probe in the matter and based on technical intelligence, found that the “British” national was actually chatting from New Delhi. A team from the BKC cyber police station camped in Delhi for a few days before they managed to arrest Casmir Chitioke and Oliver Onyeka. "The duo was produced before a court in Delhi and granted a transit remand to be brought to the city." An officer said that there is a possibility the two suspects have cheated more people using the same modus operandi. "Once we check the laptop of the accused, we will be able to find out if they targeted more victims," he said.